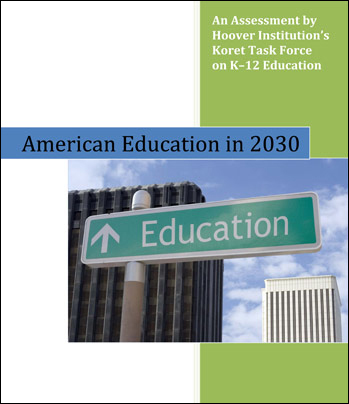 In these essays, members of the Hoover Institution's Task Force on K–12 education, joined by several keen-eyed observers, blend prediction with prescription to paint a vivid picture of American primary and secondary education in 2030. What follows is necessarily speculative, and readers may judge portions to be wishful thinking or politically naïve. But none of it is fanciful-we're not writing fiction here-and all of it, in the authors' views, is desirable. That is to say, the changes outlined here would yield a more responsive, efficient, effective, nimble, and productive K-12 education system than we have today. Readers should note, however, that each essay is complete unto itself; they were not written to yield a single coherent model in which all the pieces fit neatly together. Several cover overlapping territory (e.g., technology, which is apt to pervade our future), and others yield differing predictions about the same phenomenon (e.g., national standards and testing). The opening essay by Paul Peterson seeks to show what education will be like in 2030 if nothing changes, that is, if today's trends are simply extrapolated. The following thirteen essays are clustered into Curriculum and Instruction (five essays), Standards and Testing (two), Governance and Finance (four), and Privatization and Choice (two). The set concludes with a recap by Chester Finn of what actually changed in American education from 1990 to 2010: evidence of what's possible during the next two decades. Chester E. Finn Jr.: What Can Happen in Twenty Years?